While rockets fly overhead, Bat-Zion Benjaminson tends her garden. The religious mother of four hopes to establish an eco-village in the moshav (cooperative community) of Shokeda, which is located just six kilometers away from the border of Gaza. According to Bat-Zion, the war being fought in the area is not just with rockets. “This is an ecological war zone,” Benjaminson told the Jerusalem Post. We are on the edge of the desert here and our goal is to make it recede. This is a very logical place. That is why I am here. Because it is less expensive, I can achieve sustainability quicker. We are on the cutting edge of ecological living. 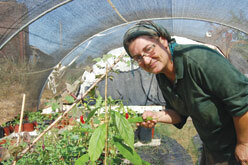 Bat-Zion hopes that she and her children will be the start of an eco-village within the existing moshav. Right now Eden’s Herbs Farm, as she has named it, is tended by Bat-Zion and volunteers from abroad. 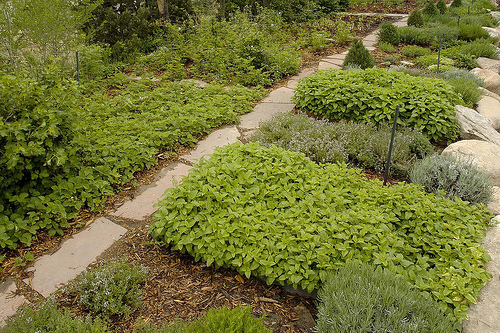 They grow herbs that are native to the region as their main cash crop, as well as bananas and other cultivations–all without pesticides, of course. Chickens roam free of any chicken coop. Water conservation is adhered to the utmost–not merely using all grey water for irrigation, but even using a waterless toilet and a shower that is open to the sky. Before moving to Israel, Bat-Zion studied permaculture. But when she moved to Shokeda, she wasn’t necessarily bargaining for a war with Gaza. The house she and her sons live in has no shelter, and the nearest shelter is 50 meters away. We hear and see a lot of helicopters and smoke. The windows rattle…We’ve learned to distinguish between the sound of Kassam rockets and IDF fire. This conflict has heightened our sense of Jewishness and has given us courage in the face of a fierce enemy. But she continues with the wry observation that her little farm is “not a very interesting target” for Hamas, who are more interested in bombing the cities. Two of her sons are currently in Netivot, and despite their newness to Israel have already adjusted quickly to security procedures. I’ve had about enough of these lies. I am her neighbor. The second picture is NOT anything like Bat-Zion’s place. This article should read: Volunteers Beware! Volunteers for BT shall live in buildings built and used for animals for decades. They she be cautious of snakes and scorpions amongst her junk piles. They shall be cautious of raw unprocessed improperly disposed of human manure. Food may be scarce depending on what the neighbors have left over (she has no chickens). Volunteers should also have backup plans as there have been many volunteers that cut their stay short and she did kick one volunteer out on the streets hours before Rosh Hashanah! BT, in my opinion, if you get volunteers you should have them work on volunteer living quarters, cleaning up the junk, and maybe have them start a food garden instead of medicinal weeds so you can feed further volunteers. Bat-Zion, if you can answer Brenda’s question here in the comments section, it will give future readers the answers they might be looking for. Keep up the great work. Bat-Zion mentions that one of her goals is to make the desert recede. Desertification (arable land becoming desert) is a big problem in the world, and Israel is one of the very, very few places in the world that has managed to reclaim desert land and allow vegetation to grow there. Erin, I chose the photo myself. I hope that settles the question. This is a nice story. Could you describe the housing for volunteers?Do you provide a private bathroom? Also could you give a sample menu of your “healthy kosher meals”? I am planning a trip to Israel and I’m very interested. Definantly ask for references… If not you will be in for a total surprise. Bat-Zion, Your ad is quite comical. Where is the second picture taken? It is definantly nowhere on your property….